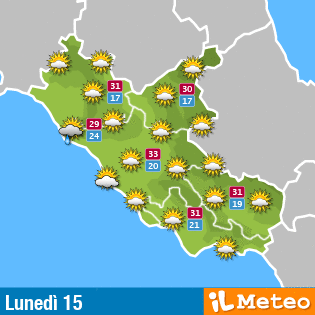 Before you leave for your trip to Ronciglione checked in real time Weather conditions. The geographical position makes the climate pleasant and mild. Natural resources are abundant in the territory of Ronciglione. The lake of Vico, not far from the village is surrounded by rich vegetation, the Cimini mountains are covered with forests of beech, oak, chestnut and oak. The undergrowth is conducive to the growth of quality mushrooms, sought-after among the gastronomes. The economy of Ronciglione finds the greatest sources of income in agriculture, crafts and tourism. Agriculture has the greatest activity in the cultivation of hazelnuts. Other typical products are wine and chestnut. Horticulture and animal husbandry are the agricultural activities of the lower areas of the territory of Ronciglione. The production activity has been developed since the past and the old factories drew the energy necessary for their work from the Rio Vicano. The ancient factories are nowadays revived in the multiform craft activities carried out in the workshops of blacksmiths, paper masters, restorers, carpenters, shoemakers, and tinsmiths. The area offers Sunday tourists ample space for cultural enrichment stops, as well as a real pleasure for the gastronomic offer. Lake Vico and Selva Cimina are able to offer high standards of relaxation for longer stays and based on nature and history, as well as the knowledge of noble and secular traditions. During the winter period the most important folk event of the town takes place, the Carnival of Ronciglione. Click on this detailed map to see the weather forecast in Italy, Europe and the world, the seas and the winds.